"Advanced Material for Those Who Want to Build More Healthy Relationships"
Pushes the limits of what to expect from relationships, good tools for intimacy development and conflict management, very practical with many exercises and examples. Slow at times, some parts overly simplistic (personality types), may feel a bit 'off topic' for some people as it goes beyond simple dating tips and covers 'self actualization', ie how to change yourself to improve your dating success in the long term as a result. This is mostly a mindset, almost philosophical product, which has its value but is not for guys who are looking for step-by-step techniques to apply in specific situations, it's more complementary to those. For guys who have found that their relationships with women have evolved in ways they didn't like in the past, this product will be helpful. This program is for advanced guys who want to get the most out of long term relationships with women. It will make you think, reconsider your past behaviors, and probably lead you to some simple but tough actions - if you have the courage! This is a product that has a unique angle in the market in that it focuses on inner game and its role in relationships. The material comes from the perspective of exclusive long term relationships (i.e. traditional relationships), and getting the most out of one deep relationship with a woman. This program goes well beyond the realms of relationships with women and ends up focusing on your growth as an individual. The reasoning behind this according to DeAngelo is that you need to become a better man yourself in order to become Mr. Right and meet Mrs. Right. David takes material from some of his non-dating courses for business like Wake Up Productive on subjects varying from leadership, finding your purpose in life, making your day productive and living with a 'clean system' so that you build your energy. This is all valuable stuff for your life - coming from my own perspective I know how improvements in all these areas of my life have benefited my relationships, so while you may not 'get' the link, trust me, it's there. DeAngelo does a good job of explaining this link in the program and obviously has chosen material based on his own progress (he gives examples of his own recent relationships in the program to illustrate). The whole program is pretty slow with many exercises and examples. On the positive side, if you are slow learner and like to work through exercises to understand exactly the implications of what is being taught this will be valuable to you. On the negative, if you get things quickly, this program will probably be too long for you - it had me 'yawning' and wanting to get on with it with some parts, and being very engaged with others. A lot of time is dedicated to dealing with emotions in relationships with DVDs 5, 6, 7 & 8) dedicated to this. Concepts such as 'emotional waves' and 'holding space' will help you deal with a variety of situations in relationships. I felt that the part on 'Facilitation process' is valid for a 'mature relationship', however, it requires that your woman have a certain level of emotional maturity in my opinion to be effective. It came across as a mini-course in being a psychotherapist. Valuable content here on what your expectations should be for a woman, and how she can bring a positive influence to your life and you to hers. This is definitely for guys at an advanced level - if you can't hold up a relationship, then it would be difficult for you to fathom starting here. That's beyond the expectations of nearly every guy I've met - but the logic is tight. The point here is - this program is pushing things to a new level in terms of what you should expect from relationships with women, that may not be for everyone (ever or yet). I was looking forward to the discussion on personality types, since obviously all women are not alike - and many guys need more guidance to use the tools provided with respect to what situations may come up and how different women may react. However, while DeAngelo normally does a good job on research, this part came across as weak. He introduces some frameworks from "The Five Love Languages", Myers-Briggs and NLP. This was overly simplistic in many areas, which caused confusion in the students on the course at times. Myers-Briggs has long lost 'validity' in the world of psychology as a reliable tool, and there are better alternatives he could have used. Overall I would ignore this, as it is likely to leave you more confused than adding any benefits - with the exception of the five love languages. If you're interested in understanding women's personality types, the best course for this is the Pandora's Box System. For guys who have found that their relationships with women have evolved in ways they didn't like in the past, this product will be helpful for you. The majority of guys in this position are self-sabotaging their relationships in some way, and this program explores a wide variety of areas where you may be doing this. This program is for advanced guys who want to get the most out of long term relationships with women. It will make you think, reconsider your past behaviors, and probably lead you to some simple but tough actions - if you have the courage. "Become Mr. Right: is a video training program that introduces a set of tools available to start, build, and sustain a relationship with a woman. 30-day trial. You will be charged after 30 days from date of purchase. "Become Mr. Right David Deangelo Review PUA"
I wonder if his first stuff was good... basically this program is similiar to his others - 12 hours of guys talking about changing there lives. The message - women want a guy with passion to change the world within a direction- "how that guy wants to do it." Pick something and tell her. "The 60 year challenge" is a much better, cleaner, shorter course. "This program is not for everyone, It Will Change Your Life. " 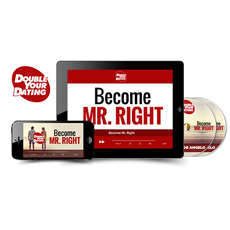 David D's newest DVD program, Become Mr Right. It has nothing to do with pickup or seduction. You will not find these tools for creating and maintaining a happy, lasting relationship anywhere else. This program is not for everyone, it will change your life. Knowledge of attraction and seduction is a prerequisite, you will never be able to have that lasting relationship with a 10 unless you can attract the 10 first. "Very Informative and Recommended for Purchase if You Get the Chance." I was also able to attend the follow up to Man Transformations, called "Becoming Mr. Right". This program was more aimed at how to maintain a long term relationship and deal with the different challenges and emotions that can arise in these relationships. I found both of these programs very informative and recommend them for purchase if you get the chance. Originally posted on The Venusian Arts Forum. Reproduced with permission. "One of the best anywhere"
This is an amazing program, the natural and wonderous evolution from David's Advanced and Mastery programs. Why? It's the first Deangelo program to focus on higher ideals: i.e. being of service to others, the final fulfillment of the "real man" that's been built in prior programs. It MAY be a tricky thing to tackle until you have some of David's "basics" covered from prior materials, which are really his distillation of a lifetime of reading books on self improvement, from people like David Deida to a WHOLE bunch more. Can you START here? I say give it a shot. You might well be served by previous programs, but if you began here I don't think you'd be going too wrong. "When your focus is on actualizing yourself, the best you that you can be, and on maximum CONTRIBTUION, giving your greatest gift, whatever that is, most other things take care of themselves, and you become 10 or 100 times as powerful and attractive as a man and a person. When you change your paradigm from "get" -- beyond "giving" even, to making a contribution -- and even go beyond "fair" relationships, where you give a little more than you get -- and develop into the greatest "me" you can be, actualizing your gifts, and contributing to the maximum level that you can, you become like a lighthouse on a dark night. You beam. You become so magnetically attractive that people just want to be around you. And when this happens you will find that you will have more amazing women around trying to get with you than you will know what to do with. This is truly David DeAngelo at his very best. 100% agreed with the above review. If you are advanced, you'll get to learn to overcome your sticking [whatever they might be] points and you can say goodbye to the seduction community afterwards. If you are intermediate, you'll learn to actualize yourself and will understand that "relationships are not chess games". If you are newbie, you'll learn everything about inner game required for modern men today [rather than a program which teaches you about how to overcome limiting beliefs and social interactions which mess with your head.. Remember, no matter how "HIGH STATUS" you are, if you are not at level of contribution, people WILL eventually leave you]. Just a note, keep a copy of way of the superior man, if you are newbie or intermediate. I never felt anything like this before watching and applying the concepts shared in this program, even though I became great at pick-up.